I made this 'Gift Guide' for Meghan's blog. I have a stomach bug & didn't feel well enough to do a new post so I thought you guys would enjoy this too. It goes hand in hand with the other wish lists I have created. As I'm sure you can see I tried to keep a pink & gold theme with all the items. These colors are so popular right now & will add a little pop to any accessory. There are so many cute options & buying a tech accessory is a safe bet because everyone has some form of technology in their life! I am in love with #8 because it is a modern take on the instant camera. I've always wanted a Polaroid one & this is just the same (but more reasonably priced!). 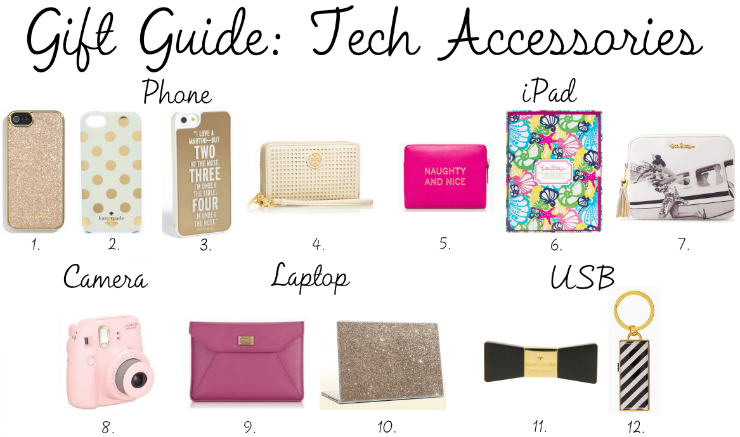 I also cannot stop thinking about how adorable the Kate Spade Bow USB is, I am obsessed with bows & this is so clever! I would love getting any of these as gifts & I'm sure any lady in your life would love them too.